The annual Sustainable City Awards returned to the greenest university in London this week. 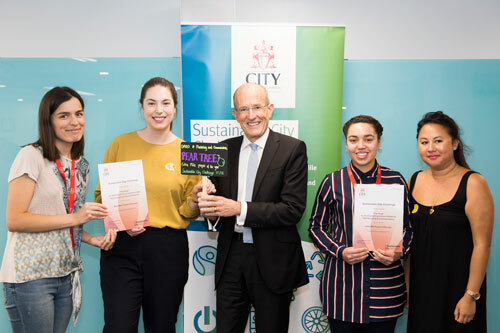 At the eighth instalment of the awards, staff from across the university were recognised for going the extra mile in their green efforts, which were set out in the Sustainable City Challenge. The City-wide contest aims to empower staff to take an active role in improving the sustainability efforts of the university, by encouraging them to make green actions, enter competitions and run their own sustainability projects or campaigns. With 17 awards up for grabs, this year’s ceremony saw a whole host of creative ideas, including designated points for electrical recycling, item swap events to bike cycling schemes. The Extra Mile Project of the Year Award went to a combination of DARO, Marketing & Communications and Elena Uderzo (BSc midwifery), for their project The Big City Swap, where staff would be able to swap unwanted goods with each other – all unwanted goods would then be donated to charity. Mickella said: “The Big City Swap allows us to donate money or swap our once loved items with colleagues around the university, in an effort to limit waste pollution. “Colleagues brought in clothes, books and homeware and could either swap their items for something else or simply donate money to the cause. All of the left over items were then given to Traid, a textile reusable charity, and any funds raised were donated to African Mothers.